Students are currently actively working on preparing for Social Studies GED exams, to take place in the coming weeks of March and April. A learning curve for all involved in finding data, guidelines to help and exchange with students. The team (Roger, Gary, Brian, Bob) has been hunting with great zest, frustration, discovering new computer skills, their success being in finding a lot of information and tools to assist the students in their preparation. BEAM raised a hand in a sea of despair: we need help, BEAM had a shortage of English teachers for February, can the team help, and with the great fortune of two new recruits (May Poole and Gordana Nardini), we were able to support their needs of four classes a week. The reports back that everyone was filled with enthusiasm, had a lot fun, gaining confidence, knowledge in exchanging culturally in English conversation. An ER emergency arose minus George Clooney, which Rotary came to the rescue in helping the school. BEAM had a shortfall in funds. 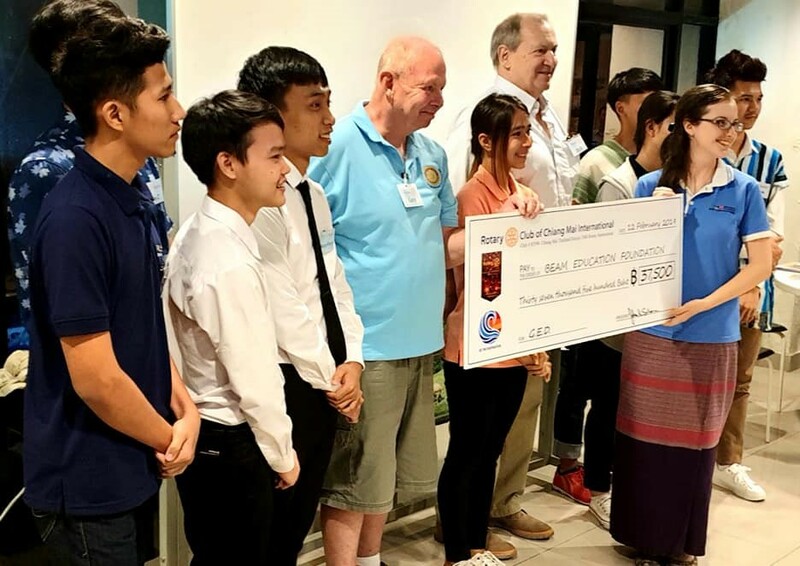 (A strong US Dollar) for GED exam costs; happily Rotary was able to assist, and a cheque was presented to BEAM in the value of 37,500 baht on the evening of 12 February. The gratefulness, joy and happiness was witnessed by all there, which words can not describe. A busy month filled with rewards, for everyone. In learning about GED and sourcing information, aids, sites on the Internet, steadfast teamwork by Gary, Roger, Brain and Bob, (May and Gordana with English studies) everyone's commitment and enthusiasm was rewarded with overflowing happy and excited attendances.